Pozdnyshev did it in the conservatory with a knife. We learn that much early on in “The Kreutzer Sonata,” Eric Samuelsen’s world-premiere one-act play, a superb adaptation (and condensation) of Tolstoy’s 1889 novella about murder and madness. Combined with a spellbinding performance of much of Beethoven’s Violin Sonata No. 9 (the “Kreutzer”), this hour-long production was the season opener for both Plan-B Theatre Company and the NOVA Chamber Music Series on Sunday night. Under the direction of Plan-B Artistic Director Jerry Rapier, three performers – two musicians and an actor – all interact brilliantly (by utterly ignoring one another), and deliver the essence of Samuelson’s script with a ferocity that demonstrates pure passion for what they are doing. Passion is a key word here. Robert Scott Smith holds the stage with a passionate, heated explanation of how his wife’s passion for music, and his suspicions that she holds a similar passion for her fellow performer, led him to murder her; how his youthful passion for brothels and profligacy lasted until he was 30, at which point he sought out an innocent woman who was worthy of him to marry; how his passion for her in a particular dress initially led him to “buy” her from her mother (he ultimately “only knew her as an animal,” he maintains); how the passion inherent in the Kreutzer Sonata meant it should not be performed in a room filled with women wearing low-cut dresses; it goes on and on. He is mad, of course. Marvelously acted, Smith flips his long coat-tails as he sits down, talking about how music has “such a mysterious power.” He is sometimes most emotive when he stands silent, back to the audience, arms akimbo or hands in pockets, precisely conveying what he is feeling. And the music – it is wonderfully passionate as well. Performed beautifully by the very lovely Kathryn Eberle on violin, associate concertmaster of the Utah Symphony, and Jason Hardink, pianist and artistic director of NOVA Chamber Music Series and Principal Symphony Keyboard of the Utah Symphony (who also conceived of this singular production) – it was chilling to be so close to such exquisite players in the intimacy of the black box theater. 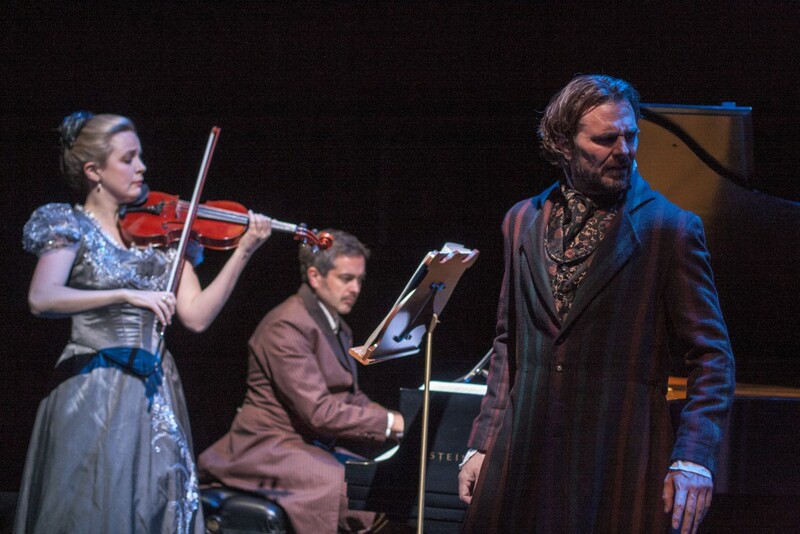 Because they are playing for Utah Opera’s “Tosca,” performances of this play are on an unusual Sunday and Monday night schedule. As an audience member noted (and I had earlier written down, ahem!) the two musicians looked startlingly like the 1901 Prinet painting, “Kreutzer Sonata,” inspired by the novella. One kept waiting for the passionate embrace. Never happened, except in the murderer’s vivid imagination. 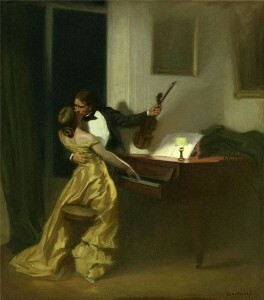 Rene Francois Xavier Prinet’s 1901 “Kreutzer Sonata” was used for years in Tabu perfume advertisements. The period costumes by Philip R. Lowe were perfection – Eberle’s sparkling dress a stunner. Jesse Portillo’s lighting was, as always, just as it should be. Randy Rasmussen’s sets, ever minimal and excellent (as in this case) rated a must-read story in Sunday’s Salt Lake Tribune. At a talk after the performance, Russian literature scholar Thomas Rogers said, interestingly, that someone called Tolstoy’s novella “a gargoyle on the cathedral of ‘Anna Karenina.’” And, as Rogers added, “they have a similar theme.” Playwright Samuelsen pointed to the women’s issues in the play: domestic violence, for one. He also said he believed it was the wife’s choice to pursue an interest of her own, rather than suspected infidelity, that enraged the husband in his play. It was the sexual content, not terribly evident in this script, that got “The Kreutzer Sonata” banned by censors in Russia and by the U.S. Attorney General in 1890. A magnificently conceived and performed evening of theater, this is highly recommended. This is a perfect review of a good production. And thanks adding the 1901 painting!